jerem-2562 has no other items for sale. Nikon 10x42 Aculon A211 Porro Prism Binocular with 6 Degree Angle of View, U.S.A. 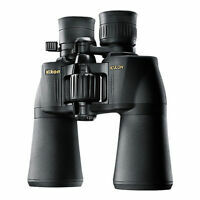 The Nikon ACULON A211 10x42 binoculars are built with multi-purpose functionality and a lightweight, ergonomic design. Shipped fast and received as stated. Looking forward to using it on our Alaskan trip later this year. Amazed at how clear it is... magnification is very good. Excellent value!! My wife loves watching birds. The 10x42 Binoculars are great for bird watching. Everything is so much clear. I love this one it's just right. This is my 2nd one that I bought one for my truck and one for home I'm very happy with it.